Our last post was inspired by a June 20th Guardian report on Alice Walker’s decision not to permit her book ‘The Colour Purple’ to be translated into Hebrew. Moreover, as we noted, Walker isn’t merely a proponent of BDS, but has characterized many of the state’s Jewish citizens as KKK-style racists, and Israel more broadly as morally beyond the pale. 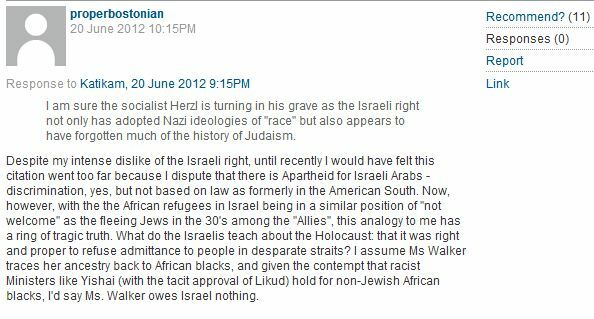 As we noted, Walker even employed a not so subtle Israel-Nazi analogy in a prior Guardian piece defending her decision to participate in the pro-Hamas flotilla in 2011. 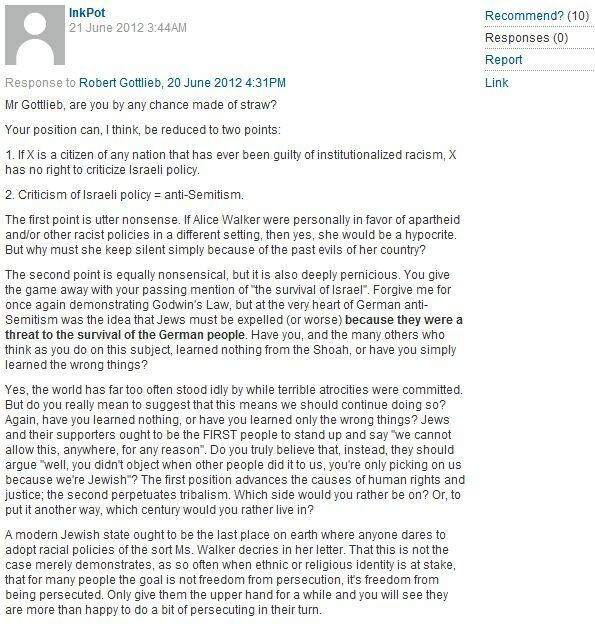 Sure enough, a few readers of the Guardian piece posted comments below the line which echoed Walker’s obscene Nazi narrative of the modern Jewish state. As of this post these comments have not been deleted by CiF moderators. Alice Walker didn’t refuse to “permit her book ‘The Colour Purple’ to be translated into Hebrew”. She refused permission for it to be published by an Israeli publisher – quite a different thing. Let’s face it, Alice Walker is extremely disturbed. “I love my mother very much, but I haven’t seen her or spoken to her since I became pregnant. She has never seen my son – her only grandchild. My crime? Daring to question her ideology. “Well, so be it. My mother may be revered by women around the world – goodness knows, many even have shrines to her. But I honestly believe it’s time to puncture the myth and to reveal what life was really like to grow up as a child of the feminist revolution…. “Ironically, my mother regards herself as a hugely maternal woman. Believing that women are suppressed, she has campaigned for their rights around the world and set up organisations to aid women abandoned in Africa – offering herself up as a mother figure. “But, while she has taken care of daughters all over the world and is hugely revered for her public work and service, my childhood tells a very different story. I came very low down in her priorities – after work, political integrity, self-fulfilment, friendships, spiritual life, fame and travel. “… I was 16 when I found a now-famous poem she wrote comparing me to various calamities that struck and impeded the lives of other women writers. Virginia Woolf was mentally ill and the Brontes died prematurely. My mother had me – a ‘delightful distraction’, but a calamity nevertheless. I found that a huge shock and very upsetting…. The Palestinians haven’t a hope if she supports them. And her statement to CNN at the time of the flotilla fiasco, that all she wanted was to see “justice and respect” for Palestinian children: “One child must never be set above another”, rings very hollow and shows her for the hypocrite she is given her treatment of her own daughter. I’m happy that she didn’t agree to publish her totally laughable rant here. According to this book males are brutal animal, the world would be a better place populated by females only. That you like it sencar is understandable, it contains pure hate propaganda without any artistic value… The Color Purple is a textbook example of the most extremist feminist racism, hate and utter stupidity. I didn’t give an opinion on the book, merely corrected an error in Adam’s post. Try reading more carefully. You didin`t correct an error, you posted a lie. Ms. Walker, in defense of her unwillingness to let an Israeli publisher publish her book, relies on a slander. Why would they be deleted by moderators ? I agree with surrealzionistr here. 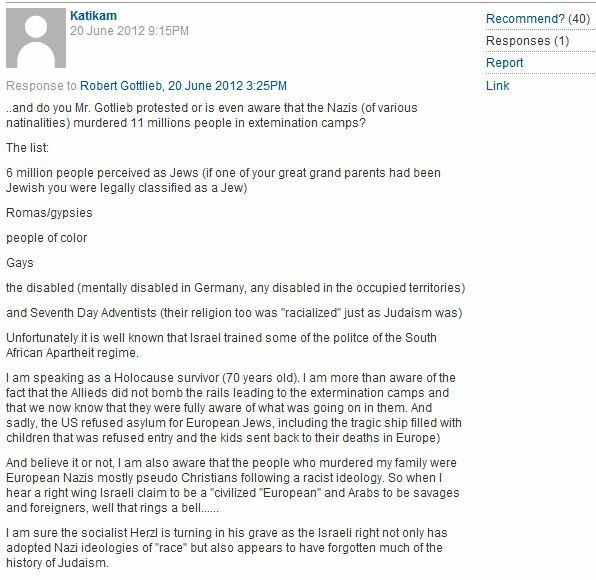 Why the moderators of an antisemitic rag should delete antisemitic posts?! Would David Duke ban David Irving? Perhaps English isn’t their first language and the CiF is outsourcing its moderation “off shore”? RZ you are free to post here any of your crap just please don’t start with your main line of your obsession with the ZF…. You are not kept here against your will. You are perfectly free to leave. Just close the door on your way out. The 4th and final session of the Russell Tribunal on Palestine will take place in New York in October 6-7-8 2012 . Following the Barcelona (which focused on EU complicity), London (on Corporate Complicity) and Cape Town (on the crime of Apartheid) sessions, the New York one will go back to the root of the conflict and focus on UN and US responsibility in the denial of the Palestinian Right to Self Determination. Twenty witnesses and legal experts coming from all over the world will address the jury panel of the tribunal. If you want to follow the work of the Russell Tribunal, please follow us on facebook and twitter. This session will consider the complicity and omissions of the United Nations and the United States of America in the ongoing occupation of Palestinian territories by Israel and the continuous violations of the rights of the Palestinian people by Israel. Q: Will it be considering the “continuous violations of the rights of the Palestinian people” by anyone else other than Israel? For instance, the Arab states and the U.N.’s own UNRWA? It goes without saying that these obsessives will not be considering the violations of the rights of any other group by any other state. The comments are shocking. I’ve never in my life witnessed so many who know nothing claim to know everything. These ignoramuses should be ashamed of themselves. The only reason they’re not is because they indeed are ignoramuses. ” I told him I had been that morning at a meeting of the people called Quakers, where I had heard a woman preach. You feel that a woman writing a novel is like a dog walking on his hind legs? I’m baffled. I thought Jane Austen, or perhaps Danielle Steele, had settled that conversation once and for all. I remember that era – the early 1980s, and it was certainly NOT unusual for a black woman to write a novel. I’m from the US and at the time Alice Walker’s writing (not just her novels) were a very fine introduction to the lives of African American women. (She has a wonderful anthology of her articles called “In Search of Our Mothers’ Gardens”). I don’t like her politics at all, but I thought that The Color Purple was a wonderful, lyrical novel. You don’t have to agree with me, of course about the quality of the novel, but it’s completely incorrect to say that “in the era which she wrote the novel it was so surprising that a black woman was literate enough to write….” Many black women were writing – fiction, poetry, plays, essays, etc. This is just scratching the surface. There was certainly no amazement in 1982 that a black woman could be literate enough to write a book. Walker is not a great writer, and her work has gone downhill since then, but the success of the book was not based on its being a novelty item. Phyllis Wheatley may be who you’re thinking of. I suppose that I relied on the wrong source. Is this an example of racism, misogyny or both? Are you asking this about the Color Purple? Then the answer is yes just it is some kind of reverse misogny – hate of anything male. Reading through the comments quoted and the references to giving asylum it becomes evident that they quite misunderstand the distinctions that most normal people do, that people fleeing for their lives have to be taken in, just as the Jews had to be taken in when not doing so made the refusing countries allies of the Nazis, complicit in their deaths. However taking in people who want a better life than their own country can give them is a vastly different prospect. Each country has a right to decide its own immigration policy, weighing what benefit to the population as a whole the addition of new residents would bring. That some politician expresses it in racial terms is indeed an insight into his own cramped little mind but it is hardly an expression of the feelings of the citizens in general. Of course, neither Israel nor any other nation can take in everyone who comes knocking. I don’t know how people whose job it is choose where to draw the line, and I don’t envy the sleep they must get at night. Is this your admission that you are a bigoted obsessive? You remind me, by the way, of the pompous foreign office official in WW2 whose response to the events engulfing the Jews in central Europe was to say: “Too much time is spent dealing with these wailing Jews”. But you, of course, aren’t obliged to listen to Jews being cry babies, you choose to be here because you take malicious pleasure in Jew-baiting. You have no sense of identity or self-worth without constantly reminding yourself how virtuous, progressive and superior you are in comparison to the myriad vices and misdemenours you can find by ‘observing’ the Jewish collective.